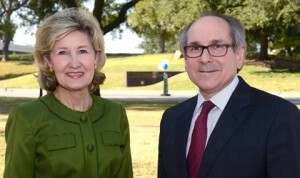 The University of Texas Southwestern Medical Center‘s central drive on its main campus is now called Senator Kay Bailey Hutchison Drive, a renaming made in honor of the former senator for her support of the facility, its medical research, and educational efforts. The decision was based on several key efforts Senator Hutchison made in her career to grant funding to several healthcare and research-related projects, benefiting patients all over the country suffering from a wide range of diseases and disorders. Senator Hutchison supported the facility while she served in several leadership positions in the Senate, helping to secure funding for research infrastructures in support of researching diseases such as the Gulf War Syndrome, and to promote the understanding within the Senate of the advantages of supporting science, technology, and education of scientists and caregivers. “UT Southwestern promotes scientific discovery, provides medical expertise and patient care that is among the best in the nation, and the medical center is educating future caregivers who will continue the institution’s legacy of service. The current medical challenges facing our nation underscore the importance of supporting institutes of higher learning and critical research and discoveries that benefit us all,” she added. Senator Hutchison’s contributions to UT Southwestern include helping to establish the Advanced Imaging Research Center, which includes a one-of-its kind 7-Tesla magnet for the measurement of the structure and function of organs, as well as supporting the nanotechnology/cancer research facility, where researchers combine both nanotechnology and molecular medicine for the treatment of diseases like cancer or autoimmune-related ailments. Hutchison’s contributions in the field of Gulf War-related diseases were crucial, especially regarding the recognition of the Gulf War Syndrome as a disorder and its impact on veterans by the military. She became Chairman of the Military Construction and Veterans Affairs Appropriations Sub-Committee and member of the Defense Appropriations Sub-Committee, and granted tens of millions of dollars to advance research on the disease, supporting the studies being conducted by Robert Haley, Professor of Internal Medicine, Chief of Epidemiology at UT Southwestern, U.S. Armed Forces Veterans Distinguished Chair for Medical Research, and a national leader on Gulf War illness. In addition, the Senator helped advance seminal studies on strokes, which allowed UTSA to be designated the Advanced Comprehensive Stroke Center in North Texas. She helped in the creation of The Academy of Medicine, Engineering and Science of Texas (TAMEST), similar to the National Academy of Sciences, established in collaboration with the Nobel Laureate Michael Brown and the Nobel Prize in Chemistry Richard E. Smalley.